1. Fantasy hits the spot when holiday magic is swirling in the air. 2. I want to know who these forest dwellers are and why they leave no survivors. 3. I love mixtures of magic and mystery. Be sure to stop back by on December 16 to check out Heather's review! Stay calm, her father’s words echoed in her head. When you find yourself in danger, above all, stay calm. Aerbrin took a deep, steady breath and leaned down, reaching for her bow. one of the Forest Dwellers charged. It collided with her and knocked her to the floor. Raising a knotted fist, he bashed her head. 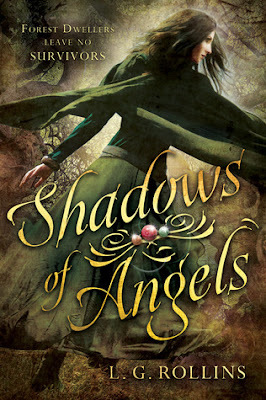 We have one Kindle copy of Shadows of Angels to give away to our readers. This giveaway is open to those who can receive eBooks from Amazon. You must be 15+ years of age to win. Those under 18 must have parental permission to enter. The giveaway runs from December 11-18. Winner will be notified via email on December 19. SHADOWS OF ANGELS has caught my imagination. Curious about the title too. To really understand the title you need to read the book, because there's too much to say Jr. But here is a little glimpse: the title refers to the demons the main character must battle.